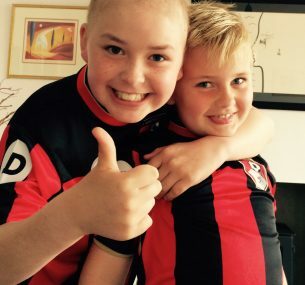 Felix is in week 109 of treatment for Acute Lymphoblastic Leukaemia. 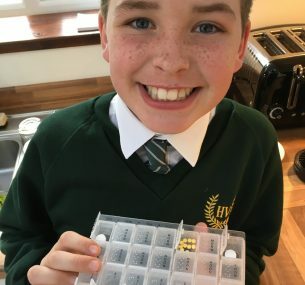 He continues to take daily chemotherapy tablets which can be up to 23 tablets in one day. 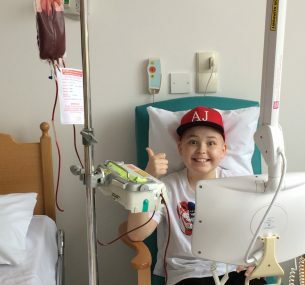 Luckily, we have an amazing community team who do their very best to make sure that his weekly blood tests do not interfere too much with his education and leisure time. Unfortunately, back in January Felix contracted Slapped Cheek Syndrome which resulted in two blood transfusions, one platelet transfusion and a hospital admission. It took him about eight weeks to recover from this and is now doing well. When he is fit he still loves playing football for his local team Poppies and recently attended a football academy day with AFC Bournemouth. Despite the rigour of treatment, Felix continues to put 100% into everything he does with the widest smile you’ve ever seen. 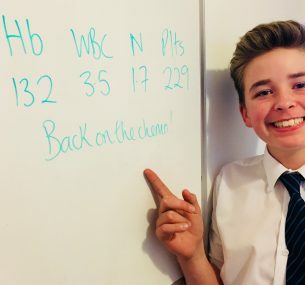 We are so proud of him and are so looking forward to starting the one year countdown to his treatment finishing on 26 April 2019. We are a regular family; a husband, wife, three kids and a dog. We have dreams, hopes and ambition. We used to think we took nothing for granted. We used to think that we appreciated the small things. We used to think we had it tough at times. Little did we know what was around the corner that would challenge all of the above. 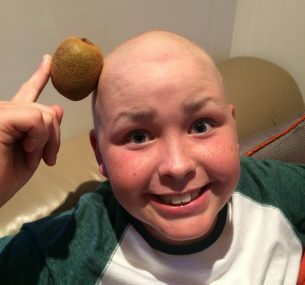 Felix was diagnosed with Acute Lymphoblastic Leukaemia on January 26 2016. Our middle child was 10 years old at the time and had just returned from a three day residential trip with the school. We guessed nothing; we didn’t see it coming at all. There had been a few clues: tiredness, moodiness, odd infections, pains in his legs but we put them all down to it being winter and his hormones. Following a rather unusual infection, Google had led me to a possible cause which our GP agreed to do a routine blood test to rule out. It most definitely ruled it out, replacing instead with a cancer diagnosis. Those early months are tough to think about now. We were all shell-shocked, numb almost paralysed. We were immediately thrown into a whole new world of oncology; portacaths, steroid treatment, chemotherapy, side effects, sickness, weight gain, personality change and stays in hospital. Our son was hurting both physically, emotionally and his brother and sister were hurting watching him suffer whilst the adults around struggled to manage their emotions. Friends and family far and wide were hurting, wanting to help, unsure what to do; the ripple effect was huge. As the months went on this whole new world became more familiar. New routines evolved where the children were not so alarmed if a different person came to collect them from school or their nanny and pops were looking after them because mum and dad were in hospital with Felix. Felix became used to the lumbar punctures, the IV chemo that made him sick, the weakness in his legs and his hair falling out. Then came the horrific mouth ulcers, the long hospitals stays due to infection and the steroid rages. Felix’s treatment for ALL will last three years and three months. In this time he will start secondary school and become a teenager with ALL riding on his shoulder. England may well even win the World Cup! Who knows what else will happen. What we do know is that having a child with cancer can happen to anyone. It has changed our dreams, hopes and ambitions. We now appreciate the small things and better understand what tough times are. We are now looking forward to the future and relishing the small things; meal times together, all three kids being at school, us being at work because a year ago we were in a completely different world. Every day we appreciate our friends and family who continue to love and support us through treatment. We also value the work of charities who do all they can to support families and fund research into cancer treatment for children. This is our story.